The Congregational Church of Faribault United Church of Christ is pleased to say that God’s extravagant welcome is extended to you whether you are single or coupled, hearing or deaf, whether you use a hearing assisted device or a walker or a wheelchair, whether you are gay or straight. 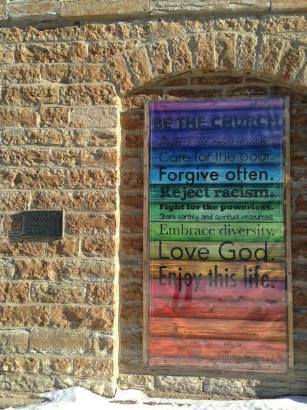 The doors of this church are truly open to all people of every age and race. Many of our members and regular visitors come from different faith backgrounds. Former Baptists, Roman Catholics, Lutherans, Methodists, and even Pentecostals are found in our pews. Because we have come to this body of faith from so many places, it is important that we explain a bit about ourselves and what we believe. Click here to also read our Statement of Faith. We celebrate two sacraments: baptism and communion. Baptism marks the entry of a person into Christ’s church. Through baptism persons are united with Christ, with each other, and with the church of every time and place. We believe that baptism can be offered at any age, but generally most in our congregation are baptized at the font as infants. Holy Communion, to which all are welcome, is presently celebrated on the first Sunday of the month. Generally, we receive communion through the practice of intinction where the consecrated bread is dipped into either wine or grape juice and then consumed. The wine is in the pottery chalices and the grape juice is in the silver chalices. In the communion meal we believe that Christ feeds our deepest needs and hungers and unites us with Christians around the world. We are people of “the book.” The Bible is the primary source of our faith. To understand it, we study it seriously looking for ways to understand its context and its message for today. The Bible was written over thousands of years. It has many different kinds of literature within its covers. We believe that God still speaks to us to help us understand God’s love and God’s call to us to be faithful. We believe the Bible was written by human beings, and it is not without error. As we study the Bible we see that even this book of books shows development of theology, culture, and language. Where the Bible seemingly contradicts itself, we look for “larger truths” to help us interpret “smaller truths.” For example, we do not hold to the passage in the Older Testament that suggests that a rebellious son be brought to the city elders to be stoned to death. Such action is not consistent with Jesus’ command to love one another. We believe that regular worship helps keep our faith active and growing. We believe that making a financial commitment to the church is also a way to make our faith stronger. Many of us tithe or give ten percent or more of our income to the church.